Cutouts and glass windows gleam with reflected candlelight in this colonial-style metal candle lamp. Bright burnished finish and a wire hanging loop. Metal with glass windows. This is 5" diameter x 9 1/2" high. Most candles will work nicely. 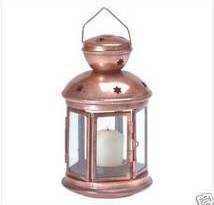 This item will burn the small round candles or votive candles . I use votive candles in mine.